SAN FRANCISCO, California, September 20, 2011 (ENS) – Nearly four years after the cargo ship M/V Cosco Busan struck the San Francisco-Oakland Bay Bridge and spilled oil into San Francisco Bay, government officials have fined the ship’s owners and operators $44.4 million. 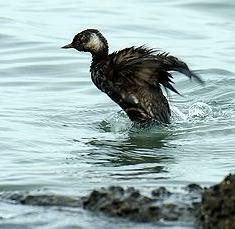 The event on November 7, 2007 spilled 53,000 gallons of oil, killing thousands of birds, impacting the bay’s 2008 herring spawn, fouling more than 100 miles of shoreline and closing beaches to recreation and fishing. 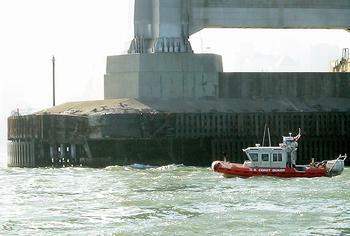 Officials announced the agreement at a press conference Monday on Treasure Island in San Francisco Bay, overlooking the site of the crash. The U.S. Justice Department, the state of California, the city and county of San Francisco and the city of Richmond signed and lodged a consent decree that requires Regal Stone Limited and Fleet Management Ltd., the owners and operators of the M/V Cosco Busan, to pay $44.4 million for natural resource damages and penalties and to reimburse the governmental entities for response costs. The federal and state natural resource trustees estimate that the spill killed 6,849 birds, impacted 14 to 29 percent of the herring spawn that winter, oiled 3,367 acres of shoreline habitat and resulted in the loss of more than one million recreational user-days. The portion of the settlement for lost human uses of the shoreline and the bay, $18.8 million, constitutes one of the largest human use recoveries for any oil spill in the United States. Of this, the National Park Service is receiving $9.75 million to improve coastal access and facilities in the bayside, coastal and estuarine areas of Golden Gate National Recreation Area, San Francisco Maritime National Historical Park and Point Reyes National Seashore. The remaining $9 million will be disbursed either directly to local government as part of the consent decree or through a grant program to fund shoreline recreational projects throughout the impacted spill areas. Of the total settlement, about $5 million will be used to fund bird restoration, $4 million for habitat restoration, $2.5 million for fish and eelgrass restoration. An additional $2 million will fund restoration planning, administration and oversight, with any unused funds to be spent toward more restoration. A draft Damage Assessment and Restoration Plan will be available shortly for public comment. Two public meetings will be held to allow for a brief overview of the restoration plan and public comments. Click here to see the draft Damage Assessment and Restoration Plan, including injury assessment and restoration project details. “Numerous NOAA scientists and experts worked on this oil spill – playing a critical role before, during, after this incident. Thanks to the hard work we have all done as federal, state and local partners, today we stand together in declaring the importance of maintaining a safe and efficient marine transportation system both for protection of our oceans and the economy,” said Margaret Spring, NOAA chief of staff. “In tough economic times we must remember that 69 million jobs are associated with healthy oceans and coasts. This settlement today once again emphatically states the importance of these jobs,” said Spring. This settlement follows earlier criminal indictments brought by the U.S. Justice Department and the U.S. Attorney’s Office for the Northern District of California. 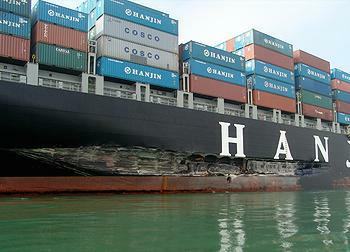 John Cota, the pilot of the Cosco Busan, and Fleet Management were criminally prosecuted. Cota pleaded guilty in 2009 and was sentenced to 10 months in prison for negligently causing the discharge and killing migratory birds. Fleet was sentenced in 2010 after pleading guilty in the criminal case to negligently causing the discharge and obstructing justice. Fleet was ordered to pay $10 million in criminal penalties, including $2 million for local environmental projects, for its role negligently causing the Cosco Busan oil discharge and obstruction of justice charges for a subsequent cover-up in which it falsified ship records after the crash.